Non-abrasive, foaming-action, solvent and cleaner aggressively attacks the toughest copper, lead and plastic deposits. Dissolves baked-in carbon and powder residue in the difficult-to-clean throat area. Extra strength, instantly strips out the heaviest copper fouling in minutes, using only patches or mops. May be harmful to some plastic, painted, varnished or synthetic stock finishes. SPECS: 200 ml (6.7 fl. oz.) bottle. Contains 5% ammonia. Неабразивный, вспенивание действий, растворитель и очиститель агрессивно атакует сложных медь, свинец и пластиковые месторождений. Растворяет запеченная в углерода и остатки порошка в районе трудно очистить горло. Дополнительная сила, мгновенно удаляет тяжелые медь, обрастаний в минут, используя только патчи или швабры. Может быть вредным для некоторых пластика, окрашенные, лакированные или синтетических акции заканчивается. Характеристики: бутылки 200 мл (6.7 fl. oz.). Содержит 5% аммиака. Manufactuor claims in "instantly" remove lead fouling etc. "Instantly" means 15 to 30 minutes. I was introduced to this stuff while attending US Army Sniper School; we used it for it's copper removal properties only... and does it ever work!! Yes, it does require some soaking in the bore (no more than 10 min), but when you push that first patch out and it looks like someone filled your bore with green/blue slime, you know it's doing it's job! Use this stuff every 60-100 shots for normal velocity calibers, more often for magnums and your bore will be happy! Using a coated rod, start with a wet patch of hoppes, then brush 10 times down and back (20 total passes), follow with wet patch of hoppes then several dry. Run wet patch of Sweet's, followed by a wet with sweets nylon brush... 20 passes... let sit for 8-10min, clean out with wet patches of hoppes followed by dry. You won't be disappointed! I have used Sweet's, JB bore paste, and Flitz to remove copper. Sweet's is by far the easiest to use with the quickest clean up. You have to be careful to clean it all out of the bore prior to shooting and you don't want to leave it in the bore for more than fifteen minutes before you clean it out, otherise it will etch the bore. Sweet's does a great job of disolving copper. 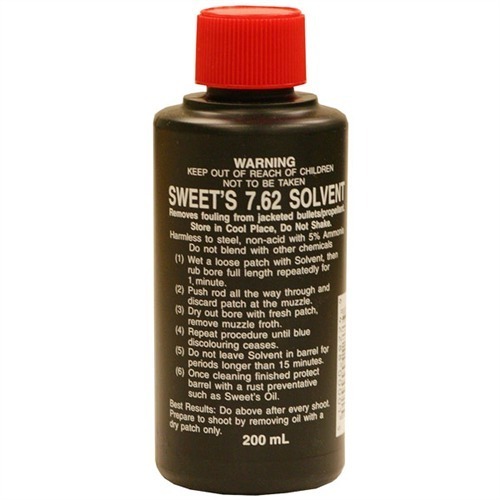 Not only has Sweet's been used by competition shooters for years, but it is a great product for collectors of military firearms when firing corrosive primer ammo. The ammonia in Sweet's will clean out the corrosive salts far better than Windex (well, I believe it has a higher ammonia content, and it is intended for cleaning firearms barrels). It will take come soaking time on a really gruddy barrel, or even multiple cleaning sessions if the barrel is one someone else messed up (I remember a new to me Ruger 77 in .220 Swift which I'm sure never saw a cleaning rod, or any attachment for one). 3 stars is average, ordinary for lead in pistols. This is no better or worse than anything else for lead. Product claims are exaggerated. I used Sweets for years while shooting Highpower Rifle matches. I would first use Hoppes #9 to remove the powder fouling, followed by Sweets to remove the copper fouling. Sweets would take minutes to remove copper that Hoppes would take all night to remove. Sweets is a very strong ammonia based fluid (keep your eyes and nose away). It is slightly more viscous than a regular solvent, so it doesn't run as quickly but it can still run. It soaks into cotton and synthetic patches well. The bbl soak time is quick compared to anything else, and folks who complain that "instant" isn't measured in seconds are naive. As an ammonia based solvent, Sweets is as good as it gets. Best used with a pre-clean to remove powder residue prior to attacking the copper. Best used for centerfire jacket residues. Patches will foam up if cycled in the bore. After a few minutes, the copper reacts and comes out on the next patch. Repeat till the "blue green" is gone, depending on how the bbl was made this may take from 2 to 20 patches. This has to be used with caution, but it is effective in removing jacket fouling. I never leave it in the bore for more than 10 minutes, and clean it out with #9 followed by a few dry patches. The method used to determine the Sweet's use is a strong flashlight played into the muzzle. Done with care, you may see what appears to be copper plating in the rifling grooves. If you can see it at the muzzle, you know that it extends well down the bore. You cannot see this plating by looking through the bore. The copper shines as much as the steel. Sweet's will get it out a bit faster than other solvents, but it's still a tedious job. This is a copper solvent for centerfire rifle. Like many I tried moly and various other coatings only to return to "naked" projectiles. That means cleaning the copper out of your bore. Tried the others- butches, barnes, and they are good but returned to sweets. Sweets is very aggresive, butches is not as aggressive, if you like overnight soaking butches is the ticket. Barnes is just as or perhaps more aggressive but tends to dry up during the 15 minute soak. I scrub with a nylon brush saturated with home made eds red, then three dry patchs. A different nylon brush saturated with sweets. let sit 15 minutes. Three dry patchs. Back to the eds red. Three dry patches and Im done. Two decades using this method with no complaints. I've been in the custom rifle building and gunsmith business for 25+ years. One of the best products I have ever used for removing copper out of any rifle bore. The 10% rule applies and I recommend following the manufactures directions, especially if using this product for the first time. IMO, the claims of bore damage by this product is exaggerated and unfounded. I've left this product in the bore of some of the absolute best match barrels available today, for hours, with no detectable damage what so ever, from my borescope. If one uses as directed they will remove the copper fouling, easily and quickly, with absolutely no damage to one's bore. Two things to remember when using this product; One is to never use a bore brush of any kind, just use patches; Two is that after using Sweet's, remove all traces of it from the bore (I use regular Shooter Choice or Hoppe's on a couple patches followed by half a dozen dry patches) and apply a light coat of oil (I use Kroil) to the bore ( as Sweet's dries the bore out and it may cause rust to develop in bore). Never had any bore damaged by using this method on my personal hunting, competition, or tactical rifle nor any of my customers. I only use this every 100 rounds or so for copper. Powder etc. it does okay on but copper this is second to none. It will take your breath away the first time you will use it. MAKE SURE YOU ARE IN A WELL VENTALATED AREA. One bottle of this goes a long way. Everyone should have this in the cleaning especially if you are shooting high speed rounds like .204. Does not clean copper fouling as advertised. Other products are far superior and do not run the risk of bore or furniture damage. I have tried every thing I can think of to make this stuff work well, even brushing and soaking and it just does not cut it. Currently using Bore Tech Cu remover, works 10 times faster and gets it all in a few tries.